We’ll provide some insights and review some of our value DFS defense picks for week 5. Cleveland Browns – Salaries: DraftKings (DK) – 2500, FanDuel (FD) – 3300. The Browns’ salary ranks them 16th/26th on DK/FD, respectively, making them a much better relative value on FD. The betting lines with the Ravens has the game total at 47 points with the Browns as +3 point home dogs. The Ravens’ implied team total is currently at 25 points and the Browns are currently at 22 points. Against the Ravens last week, the Steelers’ defense logged 2 sacks and a fumble recovery. Through the first four weeks, the Ravens have given up the 11th most sacks (tied) with 10 and allowed a middling 5 giveaways. The Browns’ defense tallied 3 sacks and 2 picks at Oakland last week. The Browns rank 1st in takeaways with 13, 7th in sacks (tied) with 12, and 10th (tied) in QB hits with 25.. The Browns unit will not have an easy matchup against a Ravens’ offense averaging the 5th most points and the 10th most yards, but they will get them at home. The Browns do have a plausible path to success, particularly through their D-line, and may be the only defense at this price range that one could stomach. 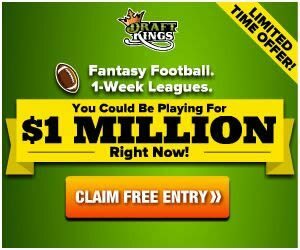 New York Jets – Salaries: DraftKings (DK) – 2600, FanDuel (FD) – 4200. The Jets’ salary ranks them 14th/6th on DK/FD, respectively, making them a better relative value on DK. The betting lines with the Broncos has the game total at 42.5 points (3rd lowest on the board) with the Jets as -2.5 point home favorites. The Broncos’ implied team total is currently at 20 points and the Jets are currently at 22.5 points. At Denver last week, the Chiefs’ defense logged 4 sacks and a pick. Denver’s offense ranks 25th in points per game with 21 and 13th in total yards per game with 383.3. The Jets’ defense ranks 13th in both points allowed and yards allowed per game with 22.3 and 355.5, respectively. The Jets’ defense recorded 2 sacks, 2 fumble recoveries, and a pick at Jacksonville last week. The Jets rank 11th in total fantasy points allowed/gm. Case Keenum ranks 28th in fantasy points scored for the position and the Jets rank 10th in defense vs. QBs. The Jets also rank 12th (tied) with 10 sacks and 8th in QB hits with 27. Keenum has the 3rd worst passer rating (60.1) while facing the blitz. If the positive game script holds, the Jets’ defense gets a nice matchup on the cheap. Cincinnati Bengals – Salaries: DraftKings (DK) – 2700, FanDuel (FD) – 3900. The Bengals’ salary ranks them 12th/15th on DK/FD, respectively. The betting lines with the Dolphins has the game total at 49.5 points with the Bengals as -6 point home favorites. The Dolphins’ implied team total is currently at 21.75 points and the Bengals are currently at 27.75 points. Against the Dolphins last week, the Patriots’ defense recorded 2 sacks, a pick, a fumble recovery, and held Miami to 7 points. New England’s 10 fantasy points ranked them 5th last week. The Dolphins’ offense ranks 30th in yards per game and 26th (tied) in points per game at 286 and 20.5, respectively. The Bengals’ defense ranks 29th in yards allowed per game and 23rd in points allowed per game with 419.3 and 28.3, respectively. The Bengals rank 12th (tied) in sacks with 10 and 4th (tied) in QB hits with 29. The Bengals’ defense logged 3 sacks and gave up 36 points at Atlanta last week. The Bengals’ defense will get a nice bump as LB Vontaze Burfict returns from suspension this week. Baltimore Ravens – Salaries: DraftKings (DK) – 2800, FanDuel (FD) – 4200. The Ravens’ salary ranks them 9th/6th on DK/FD, respectively. The betting lines with the Browns has the game total at 47.5 points with the Ravens as -3 point road favorites. The Browns’ implied team total is currently at 22.25 points and the Ravens are currently at 25.25 points. Against the Browns last week, the Raiders’ defense recorded 2 sacks, 2 interceptions with one returned for a TD, and 2 fumble recoveries. The Raiders’ 12 fantasy points ranked them 4th last week. The Browns rank 19th in yards per game with 366 and 10th (tied) in scoring with 25.5 points/gm. The Browns also give up the 3rd (tied) most sacks with 16. The Ravens’ defense logged 1 sack, 1 pick, a fumble recovery, and held the Steelers to 14 points last week. The Raven’s defense ranks 3rd (tied) in points allowed per game with 16.3, 2nd in yards allowed per game with 275.8, and 3rd in fantasy points allowed. The Ravens also rank 12th (tied) in sacks with 10 and QB hits with 24. The Ravens’ secondary gets a big bump with the return of CB1 Jimmy Smith from suspension. If the negative game script holds for Baker Mayfield, he’ll have a difficult matchup as the Ravens rank 3rd in fantasy points allowed to QBs.